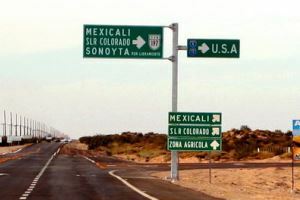 Drug traffickers often find ingenious ways to get their product across the U.S.-Mexico border, but cooperation among Border Liaison Officers can often stop them. In Mexicali, one trafficker used a pneumatic cannon attached to his truck bed to shoot packages of marijuana across the border for pickup. After some surveillance, Border Patrol caught the truck in action. Agents took down the license plate number and called an officer in the Mexicali police department, who looked up the number, tracked down the truck’s owner, and made an arrest. Border Patrol agents knew who to call in Mexicali because they belong to the same border liaison group. Although they receive little public attention, border liaison groups are a crucial part of the cooperative infrastructure between the two nations. They allow cooperation to continue during, and in spite of, political transitions, diplomatic imbroglios, and other shifts in bilateral relations. Border liaison groups are semi-formal organizations in which officers cooperate on policing cross-border crimes such as auto theft, low-level drug crimes, and smuggling. They are usually organized and maintained by law enforcement officials. The San Diego Police Department, for example, used to have a full team of officers whose full-time job was to liaison with officers in Mexico. Membership in border liaison groups is not compulsory, however, and there are no restrictions on which agencies for which a member must work. Groups usually include a mix of local, state, and federal officials. And meetings are typically held in informal places like restaurants, barbeques at members’ homes, or at organized events, such as boxing matches and softball games. Border liaison groups facilitate cooperation in a number of ways. In a structural sense, they help individuals navigate the other side’s bureaucracy – i.e. identifying which agency is in charge of a particular issue, and who in the agency you should call. They are also fundamental for establishing trust. In a context where corruption is an ever-present concern, border liaison groups give members a chance to get to know one another, and to discern potential partners’ trustworthiness. A member of the Baja state’s preventive police force (known by its Spanish acronym PEP) told us, for example, that officers often use the “gut test.” You only work with someone your gut says is “ok.” (A California law enforcement officer told us it was similar to the “gut check” he used when meeting his teenage daughters’ suitors.) Officers also use more tangible tests. It is not uncommon to share a piece of information and track what happens with it. If the information is used appropriately, the agent initiating the test may decide to share more substantial information. One of the biggest threats facing border liaison groups is funding. Budget cuts in California, for example, have led several law enforcement agencies to reduce liaison positions, or they have grafted liaison duties onto established jobs. Another problem is replicating these groups in non-border areas. The Cook County Special Investigations Unit in Chicago, for example, told us “we are the border,” noting that perpetrators and victims of crime in the city are often Mexican. Without contacts on the other side, however, the unit can only communicate through official conduits in Washington (e.g., the FBI or Immigration and Customs Enforcement, ICE) – a cumbersome process that most officers avoid. Indeed, the sorts of information border liaison group members share – drivers’ license numbers, last known addresses, known associates – are too time-sensitive for formal channels to be of use. The recent arrests of high-level kingpins in the Zetas and Gulf cartel tend to get widespread media attention, but the daily work by law enforcement officers is often just as important. Carolyn Gallaher is a professor in the School and International Service at American University. David Shirk is a professor in the Political Science Department at the University of San Diego. This project was supported by Award No. 2011-IJ-CX-0001, awarded by the National Institute of Justice, Office of Justice Programs, U.S. Department of Justice. The opinions, findings, and conclusions or recommendations expressed in this publication/program/exhibition are those of the author(s) and do not necessarily reflect those of the Department of Justice.